Nearly 400 peripheral neuropathy lawsuits have been filed in Minnesota federal court against the manufacturers of Levaquin, Cipro and Avelox. The Minutes also indicated that Plaintiffs have submitted a proposed bellwether case protocol to the Court. A response from the Defendants will be due in September. "Our Firm is representing individuals in Levaquin lawsuits and other fluoroquinolone peripheral neuropathy claims. We are pleased that these cases are moving forward, and will continue to monitor the federal litigation for any developments that could impact our clients' cases," says Sandy A. Liebhard LLP, a partner at Bernstein Liebhard LLP, a nationwide law firm representing victims of defective drugs and medical devices. The Firm is offering free, no-obligation legal reviews to patients who were diagnosed with peripheral neuropathy that could be associated with the use of Levaquin, Cipro or Avelox. Patients who were diagnosed with peripheral neuropathy or permanent nerve damage following treatment with Levaquin, Cipro or Avelox may be entitled to file a claim of their own. 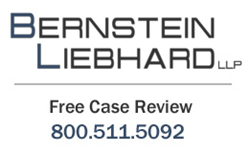 To learn more about filing a Levaquin lawsuit, please visit Bernstein Liebhard LLP's website. Free, no-obligation legal consultations can also be obtained by calling 800-511-5092.